Fake ear plugs are really funky ear piercing accessories that are designed to look like real flesh tunnels and plugs for stretched ear piercings! Fake ear plugs are available in a huge range of different sizes and designs, with funky ikon pictures and patterns to choose from. Our fake ear plug range is incredibly extensive, so you can mix and match different fake ear plugs to keep your ear piercings snazzy at all times! Fake ear plugs are incredibly crafty, they will fool everyone into thinking that you’ve stretched your ear piercing. Fake ear plugs include these bold and simple surgical steel fake ear plugs, bright and funky fimo fake ear plugs and even the bright UV Acrylic fake ear plugs! Our massive range of fake ear plugs with ikon picture designs is really funky and unique, with many different ikon designs to choose from you can find something for every occasion. You can even buy just one single fake ear plug if you only have one ear piercing. 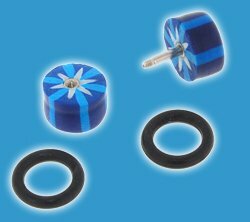 We have these fabulous fake ear plugs in Ultra Violet acrylic marble, very lightweight and comfortable to wear. 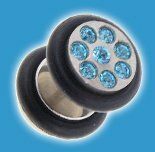 The acrylic fake ear plug is really bright and great for parties and festivals. UV acrylic fake ear plugs are designed to glow under UV light, so you’ll be glowing brightly, day and night! These funky fake ear plug tapers are designed to look like you have a stretching taper through your ear piercing! For the ultimate effect, go for a fake ear plug taper from our funky range of designs to choose from. This entry was posted in Ear Piercings, Fake Body Jewellery, Organic Body Jewellery, Surgical Steel Body Jewellery and tagged Fake Ear Jewellery, Fake Ear Plug, Fake Ear Plugs, Fake Ear Studs, Fake Ear Tapers, Fake Flesh Plugs, Fake Flesh Stretch, Fake Taper Plugs on December 6, 2009 by Piercing Guru.